You’re Fired: How Do You Explain It To Your Next Employer? If you have been fired or laid off, there are many negative things you may have to deal with. One of the things you may be concerned over is what to say to employers when you search for another job. So how and when do you tell what happened to you, and how should you explain losing your job? There are a variety of things you can say or do, depending upon your individual situation. First of all, you do not need to write that you were fired on your resume or your cover letter. It is perfectly acceptable to put your start and end dates at a job, without listing that you were terminated. Now, if you have to fill out a job application, you could be asked for the reason you are no longer employed. In that case, succinctly write something like “laid off” or “let go due to officewide budget cuts” or something like that. You can write “job ended” as well. Tell the truth, but don’t say anything that could potentially hurt you with your job search. One of the “good” things, if you can call it that, about the Great Recession is that because so many people have been fired, it is not the stigma that it used to be. In great economic times, employers may automatically reject anybody who has been fired. Nowadays, many employers are more understanding, realizing that many people let go were laid off due to economic reasons, not anything to do with the type of job that they did. Of course, there are still people these days who have gotten fired due to other reasons. 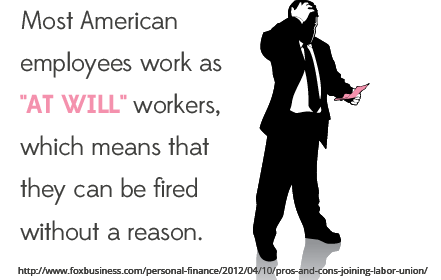 For example, a salesperson who does not make her goals may get fired for doing so. If a cashier is caught stealing money from a cash register, he could also get fired. Or if a staffer does not get along with his boss, he could also be fired. Due to all the different reasons people get fired, there is not one pat answer for what to say when it comes to explaining it to an employer. Also, don’t place blame on your old employer. You could have had the worst boss in the world, but a future employer does not want to deal with hearing negativity about a past employer. In addition, an employer does not want a rambling story in your job interview. They just want to make sure you have a consistent, logical explanation. Most importantly, don’t sweat it. Just explain what happened, and move on. In most cases, if you give a good explanation, it will not make much of a difference when it comes to whether or not you get the job. Lisa Swan is a representative of the Institute for Coaching, a premiere life and executive coaching company. How Do You Buy A Good Laptop?